Well, the Bite-Size Arts Ensemble is finally ready to lift off. From a starting point of ten artists, three have been willing to do the work needed to help advance their careers. 1 out of 3 isn’t too bad of a result, as far as I am concerned. It takes usually 7 knocks to open a door and I got 3 out of 10 on the first doorbell ring. I am overall pleased with these first round results. The three individuals are: Darlyne Cain, singer/songwriter, Brian O’Hern, The Model Citizens Big Band and Juggler Dharmesh Bhagat. Besides being extremely talented, these individuals each are gems of human beings. I am building a starter site at www.ReverbNation.com/bitesizeartsensemble. Check us out there or click on the right side of the panel of this blog. You can help promote the work of this ensemble by going to ReverbNation and picking up a widget and putting it on your website or your own blog. We need fans and can certainly use your help. 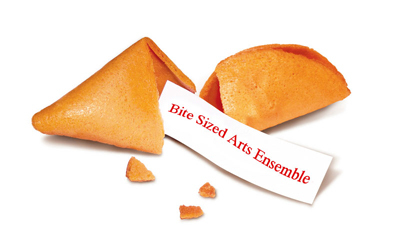 The Bite-Size Arts Ensemble’s 501c3 status came through just a little less then two weeks ago, so we can now officially ask for donations and offer a tax deduction. ( Kind of hard to put up a web site as a not for profit and ask for donations without having the 501c3 government recognized status.) If you are contemplating filing for this status, as an already established not for profit corporation, make SURE to use an attorney. I negotiated with my attorney a flat fee to do the paper work. The paperwork is complicated enough that you will be much more likely to get the status if you do. As for the ensemble, the next steps include filming for the video portions of our productions, which have already begun, building the website, finalizing a short list of theaters for our first few shows as well as finding a couple of venues for a fund raiser or two we hope to have planned before June is over. Our next big board meeting to make these decision is next week! Our actual launch date for this performance based entrepreneurial incubator is Fall 2008: Sept/October depending on theater availability. While the ensemble itself is focused on developing creatively and building entrepreneurial skills for artists, the goal is also to offer our audience members the opportunity to explore their own creativity through our productions as well as through the offerings of the artists themselves. Stay tuned for more… this baby is about to take flight! Me, me, me, me, me…what does this mean? It could also be a reflection of the focus of a nation turning inward towards ourselves because we are increasingly having trouble affording gas for our car and food to fill the refrigerator. Over the recent weeks I have been speaking to a large number of artists who have been telling me that the phone is not ringing with work, the gigs they did last year were cancelled or postponed this year and they are not sure what is going to happen next. Recently, my friend Peter Rossi, a photographer, has been telling me things are slow. Peter generously has offered his time to me to work on shooting video for the Bite-Size Arts Ensemble, since his studio is not scheduled with shoots like he would have hoped. It is also giving him an opportunity to explore the world of video to potentially incorporate into his work. Lots of folks these days are interested in having high quality podcasts on their websites. Interestingly, as we have spent time together working on this project, Peter has been more at ease then usual about the fact his phone has not been ringing with work. And interestingly enough it has now begun again to ring with calls for new shoots! Now, perhaps all of this is coincidence. Or just maybe when we give to others instead of focus on ourselves, the universe offers us the opportunity’s we need to do, do, do, do, do…. The last few weeks I have been working very hard on really pulling together the core members of The Bite-Size Arts Ensemble. The Bite-Size Arts Ensemble is a performance oriented entrepreneurial incubator, the first of its kind, in Chicago. I will be helping each member in it, over the next four to six weeks, develop a business plan that will in a key way be reflected in the context of their performance with The Bite-Size Arts Ensemble. The results of these performances will lead to test marketing each artists services through a variety of for profit mediums through Entrepreneur The Arts. My goal is to build a not for profit organization that leads to a for profit business for artists. We are looking at theater space now for fundraisers at the end of May early June and performance starting across Chicago-land every other week after that. Needless to say, there have been a lot of in depth conversations being had with all these various individuals. Many exciting conversations, and yet as I begin to get into the lives of some of the artists I have selected, I realize I have bit off a lot to chew. Everyone I am working with is in their 30’s and 40’s. All of them have never planned their future on paper, feel they know very little about money management, and have not as many ideas as they would like about how best to market their skills. And yet all of these artists, unlike so many who have given up and taken day jobs, have found ways of at least surviving in the arts for a living. Am I insane to try and help simultaneously ten or more individuals like this? What am I thinking? I come at this with both the enthusiasm of a child -because this truly is my life’s work to help artists- and the fear of an adult. Will each one of them really let me help them? Will each one be willing to invest enough time and energy into developing their own marketing plan with me? No matter how many times we need to adjust their marketing plan, based on feedback and test marketing, will they all hang in their and keep the faith? Will we get enough of an audience at all our performances and enough interest in each artists services to really test how well each artist’s services can sell? While I have worked with many many artists in this way over twenty years, I have never tried to do this with my direct involvement in a common project. The hardest thing about entrepreneurship in the arts is allowing room for mistakes, trial and error and correction. To most artists this is a foreign concept and hard to do because we are all so use to being told we have to get it right the first time. But for those of you who have been reading the evolution of my concept of The Bite-Size Arts Ensemble, it should be clear to you what I am talking about- because I have gone through lots of shifts and changes with where it is headed only to arrive at this point right now. I am beginning to feel the chaos of trying to get this all pulled together not to mention the work that still needs to be done to secure the theater spaces and fundraise. I am a sucker for a big challenge. But when it comes to helping the arts I feel like an addict: I am desperate to find something concrete, that I can produce using my entrepreneurial and artistic skills, to effectuate real substantive changes in the arts, or at least starting with the little sliver of it I see. I have spent my entire life looking for a real way to create safety, an appropriate pay scale, health insurance and a retirement account for those who are creatively our most talented. I built a business for twenty years trying to help artists to flourish and I simply cannot stop trying now. Yet I know I cannot do this alone- which makes me worry about how I will find more helping hands. Hands to spread the word about my work. Hands to encourage me to keep going when I am overwhelmed. Hands to clap at our performances. Hands to write checks to donate funds and hire artists and hands to cheer me on. This ensemble, and all of you reading this blog- your interest in improving the state of the arts must continue to grow. I simply am not able to do it all even if I have a heart of desire that wants me to believe I could. Nor am I able to alone convince anyone and everyone that the arts need all of our hands of help to change its future into something far brighter. Ron had such a huge heart, a great voice and a bad alcohol problem. He never could pull it together. Most nights you could find Ron asleep riding on the EL train in Chicago. He was homeless. Along the way, he gave impromptu coachings to any who wanted tips on singing. On the street. At the EL station. In the alley. Ron simply loved to sing. A friend of mine told me she heard him sing several times and gave him money on occasion, when she had it to give. Many artists around Chicago knew Ron and often invited him on stage to sing with them during their own gigs. What if we as artists could harness the power of the free market to solve the problems of poverty, hunger, and inequality? To some, it sounds impossible. But Nobel Peace Prize winner Muhammad Yunus is doing exactly that. As founder of Grameen Bank, Yunus pioneered microcredit, the innovative banking program that provides poor people––mainly women––with small loans they use to launch businesses and lift their families out of poverty. In the past thirty years, microcredit has spread to every continent and benefited over 100 million families. But Yunus remaines unsatisfied. Much more can be done, he believes, if the dynamics of capitalism could be applied to humanity’s greatest challenges. As artists we need to find ways to change our own futures and the futures of those we know who suffer. Become passionate about helping others by finding your way to financially benefit and change the state of the arts. I am on my own mission to do exactly this through offering information, insight and support through this blog, my workshops, speaking, book and also through The Bite-Size Arts Ensemble. This ensemble will serve as a Chicago performing artistic entrepreneurial incubator for the benefit of artists, by assisting corporations, leaders and those needing inspiration learn what participating in the arts can do to help them thrive. For those of you wondering why I have not posted in awhile, I have been suffering from a really bad cold. Taking a few days off to rest is not easy for me, but I have felt poorly enough to not ignore following doctors orders. I am one of those that thrives being very busy, so it is hard for me to simply sit around. Besides that, my agent, Susan Schulman, is finally sending off Build a Blue Bike to prospective publishers. She tells me in about six weeks we will know who is interested in buying it and then an auction will be held amongst the prospective interested parties. By Christmas my book should have a publisher. While impatient me wishes this was all happening sooner, all of this time is well needed to get back to working on the other projects I have begun. 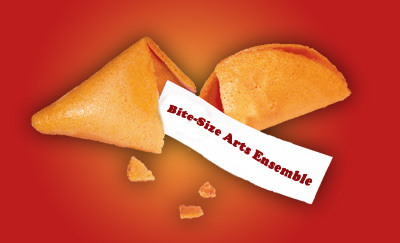 Finally, The Bite-Size Arts Ensemble web site will be built. I have almost everything completed to put it up. It has been a complicated process building this not-for-profit venture, because I have had to sort out all of the various ways I want to use this concept and define where each part belongs. If you too are a creative person, than I am sure you also generate lots of good ideas. Most artistic/creative types do- sometimes by the minute. The trick is to figure out which ones are worth working on and which need to be set aside. I have had to sort out my concepts for Bite-Size in this same way. One part of The Bite-Size Arts Ensemble will be the entrepreneurial band I take with me to schools to present my speech called Creative Value. Another part of The Bite-Size Arts Ensemble is building entrepreneurial artistic incubators, for students at institutions of higher learning, through my concept of building creative currency. Yet another part of The Bite-Size Arts Ensemble, is my own entrepreneurial performing group, here in Chicago, that will showcase a diverse talent base of artistic entrepreneurs in an entertaining setting while providing a performance/showcase venue for myself and others. One of the problems I have had developing my concepts for Bite-Size is that, as you can see, I have had so many ideas about what it can do, that I have had trouble sorting out where all of them purposefully belong. Each idea I found to have merit needed to find a proper place to work. One of my goals with this blog, is to help you see how I too struggle to sort out various parts of things I create. If you go back and look at other posts about Bite-Size you can see my struggle and progression. Letting time pass to sort all this out has been a very good thing. It has allowed me to reflect and think about what really matters to me in life and how I can use my passion purposefully. I want the ventures I create to last a long time, so it is worth it to me to take the time to try and set them up to work for me and be well integrated in my life. I hope you will take the time you need, with your very next great idea, to find a place for it to work in your life. Every moment you spend on it, try to figure out how it can shape who you are and what you can become. Business plans are a work in progress. Think of them like a lens on a camera that is out of focus. At first, you describe what you can see and as you work to bring the lens into focus, it becomes clearer and clearer. My Bite-Size Arts Ensemble has been going through this exact process. Finally, I have been able to move the lens of the camera to a place where I can see a sharp and clear image, thanks to my trip to Italy. As a highly trained artist I have been taught to get things right on the first take. When I strive for that in the business world I find myself impatient and frustrated. Business plans typically do not work well at first. In fact most plans fail, as do most small start-ups, because their creators do not take the time needed to sharpen their vision before they start spending time and money. The biggest financial mistakes are usually made at the very beginning of a venture. My goal for Bite-Size has always been to promote the arts in a new way and build a solid audience base. Finally the pieces are coming together to do just that. I have the musicians ready to play when called on, I have several venues identified, but need to still find more. I have a board of directors assembled to help make decisions for the organization, and I have worked to develop some potential donors to initially fund the organization. I have a former student, who works for Edelman PR in Chicago, hired to build a PR campaign to tie Build A Blue Bike and The Bite-Size Arts Ensemble together. I also have the assistance of a recently graduated freelance journalist to help identify newspaper and magazine contacts and write articles, who too shall be paid. Recently I have identified a professional photographer who will creatively contribute to the actual production development in exchange for recognition and the cost of film. I am now in pursuit of a filmmaker who will also creatively contribute to the production. I must raise enough money to pay for the promotion of the ensemble. Fortunately, my board will donate money to help with this as soon as I ask them to. My very next steps are to build the website and build a PR campaign in the City of Chicago. The PR campaign will initially focus on asking for submissions from artists, in any discipline, who excel at their art form, but need help developing the business and marketing aspect. A panel of judges will select these artists, and over the course of 6 months, a production will be built to entertain, enlighten and educate our audiences to the possibilities in the arts. This production will initially be showcased in different venues around the city of Chicago, with the goal of taking it on the road. My ultimate goal is to build workshops in universities for students to build their own Bite-Size Arts Ensemble, creating a franchise paid for in creative currency. Just like my book, the development of this concept has been a slow, agonizing process. Every aspect of its development must fit all my various interests, purposefully help others and have the ability to generate an ample amount of income. For me, these are the rules of entrepreneurship in the arts. I believe this ensemble and my concepts are original. By promoting the ensemble alongside my book, I create human interest stories that will attract an audience. Audiences love to get close to artists. By promoting the ensemble production as part of what I offer in services to those who hire me to speak and do workshops, I also believe I will be able to attract grant money and certainly donations from individuals for the development and service of helping artists thrive. I also believe I will inspire schools to build their own Bite-Size Arts Ensemble and maybe even rethink the content of courses offered, to help graduates with a degree in an artistic endeavor thrive. As an artist who has been highly trained and repeatedly asked to get it right the first time, the process of working slowly through all these issues and allowing them to find their resonating spot has been very difficult for me. I am impatient and have been trained to do things well, quickly and the first take– not an easy thing for me to live up to in business. It has been a blessing and a curse for me to have such high expectations of what I can accomplish. A blessing, because I shoot for the top and have the discipine to reasonably think I can get there; from learning how to develop an art form to a high level. It has also been a curse, because business simply does not work that way. It takes time to build something of worth and value. You must often stumble, trip, do a 180 and be unsure. Through planning and research, if you do these things, you discover what will work and what won’t and must adapt accordingly. Thus one’s emotions and passions must not be the entire guiding force. The plan must be well defined to financially support your passion and emotion and allow it to flow like a river into the venture’s structure. When you learn to combine entrepreneurship with creative passion, you learn the power of both business and art. You also learn when you need to think like a business person– allowing yourself the room to trip, stumble, sit still and adapt. You also learn when the time has come to allow your creativity to set you free and float over what all that pondering has produced as a financial vehicle- your foundation from which to build your creative venture. 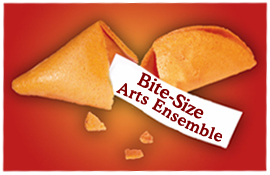 I am done pondering The Bite-Size Arts Ensemble. A foundation has been built and now comes the time to have some creative fun!